Blackwater guards are in one incident at least finally being sentenced to prison for murder today. But their boss will be speaking at the University of Virginia on Wednesday. Jeremy Scahill, author of Blackwater, visited Charlottesville 8 years ago and explained some of what’s wrong with private mercenaries. He said that the Pentagon is useless to politicians because it doesn’t make campaign “contributions”. But when you take a big chunk of that enormous military budget and give it to private companies, you free it up to come back (some portion of it) to politicians every campaign season. Thus you trade higher costs and less oversight for a built-in generator of systemic pressure for more wars. It’s win-win-win. Scahill described the then recent “Bloody Sunday” incident in Baghdad in which Blackwater mercenaries shot and killed approximately 28 Iraqi civilians, including women and children, in a square. The Iraqi government claims to have video proving the shooting was unprovoked. Witnesses corroborated that story. Within hours of the incident, Condoleezza Rice phoned Iraqi President and Bush puppet Nouri al Maliki. Within 5 days Blackwater was back on the streets. Five days. Prison sentences took 8 years. House Oversight and Government Reform Committee Chairman Henry Waxman asked Prince to testify before Congress, but Prince had previously chosen not to. The State Department told Waxman that any information it provided Congress on occupation contractors would be classified. Scahill described the size of the problem. There were at the time 181 “security” companies in Iraq and 180,000 private contractors, tens of thousands of whom were mercenaries. And they were basically unaccountable. When a Blackwater mercenary shot and killed the Iraqi Vice President’s body guard, Blackwater snuck the shooter out of the country. In February of 2007 year, Waxman held hearings and invited Prince to testify. Prince did not show up, but sent his lawyer instead. Rep. Dennis Kucinich noted at the hearing that Blackwater appeared to be complicit in the flight of a murder suspect. A US soldier can be court martialed. There had by 2007 been 64 courts martial for murder charges in Iraq, which Scahill found stunningly low, given that in his estimate there had been 750,000 Iraqis killed. Mercenaries are generally not prosecuted under Iraqi or U.S. law or courts martial. Scahill said that when he recently testified before Congress, the whole issue seemed to be brand new to Congress members. After four years of slaughter and wild west tactics in Iraq, Scahill said, two freshman senators had finally proposed establishing a system of justice for mercenaries. Scahill seemed to be of two minds about this proposal. He recognized that mercenaries, aggressive wars, and foreign occupations were illegal to begin with, making their regulation a dubious endeavor. He recognized that the mercenary companies were themselves supporting the proposal, and that this was a good indication of how worthless it was. Yet, he found something encouraging about the fact that there was a proposal and a discussion underway. Scahill had recently given a talk in Eric Prince’s home town in Michigan (a town described well in Scahill’s book). 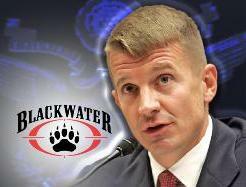 Prince published an op-ed in the local paper claiming that Blackwater was not a mercenary company. But, Scahill explains, Blackwater has hired soldiers from countries like Chile whose democratically elected governments opposed the occupation, and sent those soldiers to fight in Iraq. Employing soldiers to fight for a foreign power, such as Chileans for the United States, is the very definition of mercenary used by Prince himself. The Democrats in Congress were asleep on this issue, said Scahill, and he blamed the financial “contributions” they received from the war industry. Prince is still very much active. Possibly due to concern over criminal investigations and civil suits, Prince has set up residents in the United Arab Emirates. But from there he oversees the same corrupt murderous activities for the U.S. and other governments. Why exactly does the University of Virginia see fit to invite him to speak?